Offering you a complete choice of products which include spice extracts. 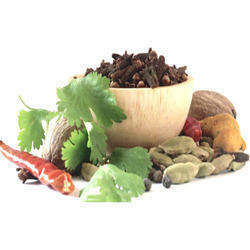 We are a well-known manufacturer, exporter, wholesaler and supplier of superior quality Spice Extracts. Offered products are commonly used for food, medicinal, culinary and cosmetic purposes. The process of extraction is used, wherein the herbs are mixed with alcohol and the other types of herbal extracts. These extract are made using handpicked solid matter is removed leaving the oils with the alcohol. This is known for superior quality floral absolutes, waxes, spice/herbs extracts and dried or fresh herbs, in combination with alcohol. Recommended Usage For Thin Gravy: Add 50 gms. premix 250 ml. of milk 50 gms. cream 150 gms. tomato puree 100 ml. water and simmer on medium heat for 1 to 2 minutes. For Thick Gravy: Add 50 gms. premix 50 ml. of milk 25 gms. cream 150 gms. tomato puree and simmer on medium heat for 1 to 2 minutes. Shipping & Storage: Shipping and storage temperatures should not exceed 40°C. Storage should be in a clean & dry place. Looking for Spice Extracts ?